827 Dean was built in 1954/6 by Harry Poschman, a local ski operator/builder/traveler. 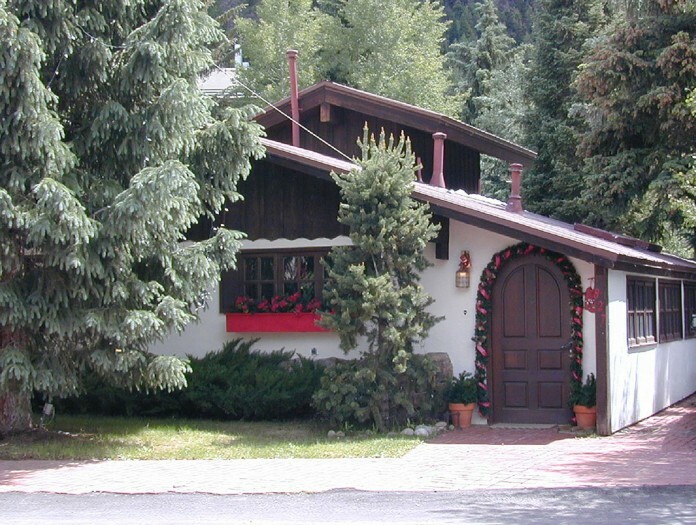 This home illustrates two important aspects of local postwar history: the chalet style, which illustrates Aspen’s period of significance as an international ski resort, and the significance of local Harry Poschman to Aspen’s cultural heritage.827 Dean Street has a few nicknames: The Christmas House, Le Petit Chalet Blanc and Le Petit Chalet Enizien, and was built in the Swiss chalet tradition. The Christmas House is oriented toward Aspen Mountain on the site, and is unique in that its front façade faces the rear of the lot- which results from a plan to extend Water Street that was abandoned after the establishment of Glory Hole Park. 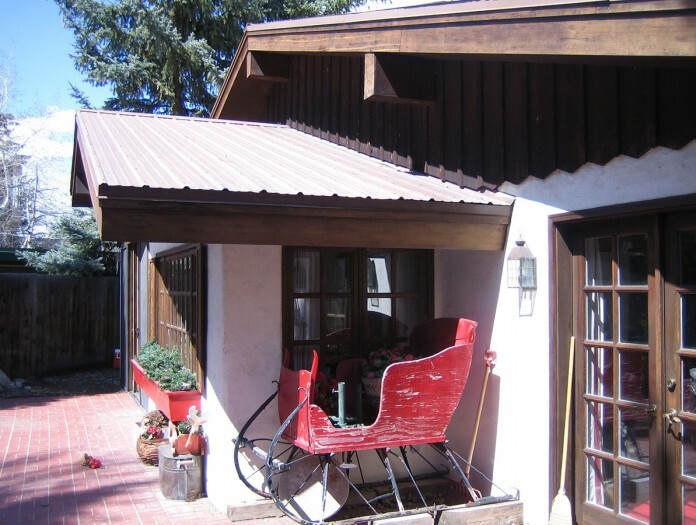 The Christmas House exhibits the chalet style through materials (combination of stucco and wood cut out details), one story scale with a small base, window boxes and rectangular windows, and a generous gable roof. Harry Poschman was born in 1913 in Beaver Falls, Pennsylvania where he began skiing on homemade skis. He moved with his mother and sister out to California where he pursued skiing and was a founding member of the San Diego Ski Club. After the Pearl Harbor attack, Poschman enlisted and moved to Colorado as a ski instructor for Mountain Training Group at Camp Hale (Leadville). Similar to many Aspen locals of this era, Poschman was part of the 10th Mountain Division, and fought in the mountains overseas. During the War, he developed an appreciation for the chalet architecture he experienced in the mountain villages of Europe. Upon returning to the mountains in the States after the war, he committed to “make skiing his life” and became a ski instructor traveling between Alta and Aspen with his wife Jonny. According to his son Greg Poschman, Harry was greatly influenced by the mountain architecture in Europe and wanted to bring the style back to the States. He helped build Lift One in Aspen in 1946/7; and similar to many Aspen locals, he performed a variety of jobs which included building houses. Greg Poschman recalls his father traveling to Switzerland, after the War, and photographing chalet style houses to build in Aspen. 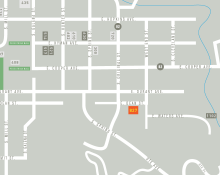 In addition to 827 Dean Street, it is thought that only one other Poschman-built chalet remains in Aspen. He built and operated the Edelweiss Chalet on Hopkins Avenue, which has been replaced with the Hotel Lenado; a chalet located on West Hopkins Avenue was demolished; and a little chalet in the Knollwood area remains intact. Harry actively influenced the development of Aspen as a ski destination by becoming a one-man chamber of commerce for the town in the 1950s. Harry Poschman exemplifies the culture in Aspen following the end of World War II that shaped the town we experience today.